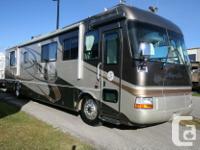 A BEAUTIFUL 2000 AMERICAN DREAM 40 DS BY AMERICAN COACH (Fleetwood) IN EXCELLENT CONDITION! Dual slides on Spartan chassis, Cummins 350 turbo diesel with 76000 miles, brand new exhaust brake (Pacbrake) with twice the breaking power, air suspension and air brakes, new Michelin semi-size tires on 22.5 inch wheels with less than 1000 miles, new paint job, new front upper and lower ball-joints, full front plexi cover, Onan 7.5 kw quiet generator, 3000W inverter, dual ducted air conditioning, dual furnace, hydraulic leveling jacks, hitch and towbar, large patio awning, new slide out toppers, awnings over windows, plenty of basement storage with two slides, leather power captain seats, washer/dryer combo, back up camera, and more! 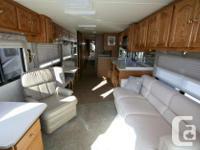 There is a queen-size bed in the aft bedroom, plenty of overhead storage, a wardrobe closet and drawers. For additional sleeping accommodations there are 2 leather pull-out sofas, the kitchen features a 3- burner stove with oven, convection/microwave, 4-door refrigerator/freezer, stainless steel sink, corian counter tops. There is a split huge bathroom and shower with glass doors and skylight and a vanity. 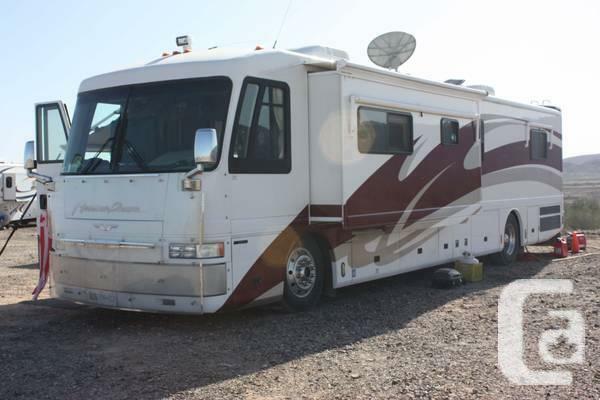 For entertainment there are 2 tvs with antenna signal booster and a brand new Shaw Direct automatic HD antenna system and tuner, DVD player and stereo system with speakers throughout and a CB radio. Day/night shades, beige carpeting, tile flooring, upgraded solid walnut cabinetry. This is a beautiful coach in mint condition!! Please call .